Members of the Appalachian Highlanders Pipes and Drums take pride in demonstrating their philanthropic spirit by donating time and talent to various community efforts. Based in Abingdon, Virginia, the Appalachian Highlanders Pipes & Drums brings together individuals from all over southwest Virginia and northeast Tennessee, who share a common interest in our Scots-Irish heritage and the thrilling music of the bagpipe and drum. Ranging in ages from 18 to 80, our members come from a variety of backgrounds, including: doctors, dentists, teachers, engineers, computer programmers, and students. Disproving the old adage about old dogs and new tricks, most of our members took up the pipe later in life. 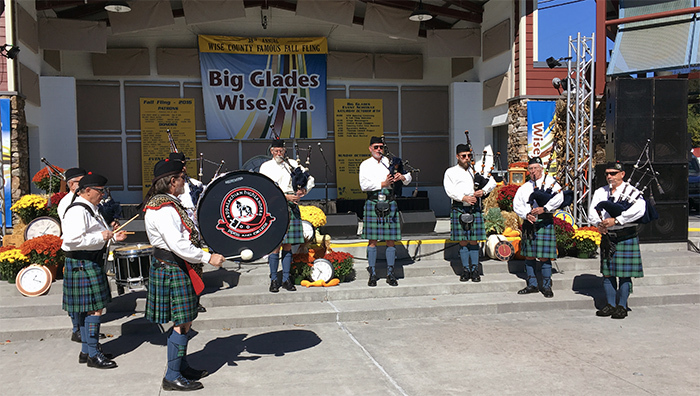 In the past few years, we have had the honor and privilege of sharing our love for the pipes by performing throughout the region at events such as: Plumb Alley Days and the Virginia Highlands Festival - Celtic Music Weekend in Abingdon, VA, the Radford Highlanders Festival in Radford, VA, several fall festivals in the region including Wise, High Knob, and Cedar Bluff, VA, the Upper East Tennessee Celtic Festival in Johnson City, TN, Bristol's Rhythm & Roots Reunion in Bristol TN/VA, the Roanoke St. Patrick's Day Parade and Celtic Festival in Roanoke, VA, Big Stone Gap Celtic Festival in Big Stone Gap, VA, with the Symphony of the Mountains and Dobyns-Bennett Symphony, and the famous Barter Theater in Abingdon, VA. In addition, some of our members give their time to provide programs for school groups and music clubs about our cultural heritage and the music of the bagpipe. Since so many of the original settlers in our southern Appalachians were Scots-Irish Highlanders, we are delighted to have the opportunity to celebrate that heritage by participating at these events. Membership is free and is open to anyone, male or female, regardless of age, that has an interest in playing the bagpipe or drum. We are a non-competition street band. Our main purpose is for enjoyment and entertainment but we are also dedicated to playing our music well. Piping and drumming instruction is available for individuals who are serious about learning to play. Previous musical experience is desirable but not necessary.